1. Combine potatoes, butter, cream, salt and pepper in a bowl. 2. Add spring onions and mix until well combined. 3. Keep aside for a minute or two. 4. Add the egg yolk and mix well. 5. Keep the bowl in the fridge until firm. 6. Remove the bowl from the fridge and bring to room temperature. 7. Take a spoonful of the mixture and place a cheese cube in the middle. 8. Roll them into small balls and roll them in the breadcrumbs until well-coated. 9. Keep the balls in the fridge until firm. 10. Heat oil in a deep pan over medium flame. 11. Deep fry until golden brown. 12. Serve hot with ketchup. 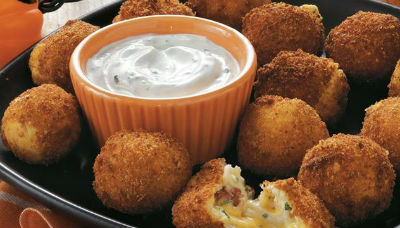 Feel free to comment or share your thoughts on this Cheesy Potato Balls Recipe from Awesome Cuisine.